The Namaste completes half her loop, suffers serious internal injuries and retires to Indiantown, FL. Since I do not know where to begin to tell this saga I will start where I left off last April. We were heading across the Okeechobee Waterway to end a great season exploring the Gulf Coast, Keys and southern Florida. Given the extremely skinny water of Lake O, we made an anxious but smooth crossing on a gorgeous day not seeing another boat during the entire 32 mile trip. We arrived in Indiantown and spent a hot several days putting the Namaste to bed in a prime spot on the hard just behind the “resort” area of Indiantown Marina. As friends Carole and Paul Nothe arrived for a visit in 100 degree temps, we completed tying down the tarps in dozens of places, added hurricane straps and left for dinner at the local Country Club on our way out of town. The Namaste was in mint condition and we had done the best job ever of securing her for our intended long absence. Really getting to know our two newest grandsons – Cedar and Oscar. Attending Lexi’s high school graduation and admission to MSU, Lyman Briggs. Watching Ashleigh enjoy the best summer ever including Camp Lookout and MSU Vet Camp, trips to Calgary and North Carolina and a strong finish playing hockey in Finland and Sweden. Hosting Bastian (1995 Bremen, Germany exchange student), wife Christine and Lisa (5) for a whirlwind Michigan vacation. Directing camp Dunham Lake with Liam (Lee) and Klava where they both passed grandpa and grandma’s swimming test – crossing the Lake. No problem! Enjoying adventure filled weekends at Camp Lookout and the Boyne House. Standing-by with lumps in our throats as Nate entered kindergarten in Hartland and Leonie the young 5’s program in Ann Arbor. And finally celebrating all 9 grandchildren birthdays in 71 days between November 13 and January 23. That is almost one a week! All was perfect until Irma unleashed her fury on Florida on September 10th while we were on a brief get-away to Michigan’s beautiful UP. Like you, we watched and listened to the news, anxious and sad but feeling confident that the Namaste was securely tied down and inland far enough away from high-water dangers. It took several days but we were relieved to hear from marina staff that all was well and only a few boats suffered minor damage in Indiantown. Whew, we had dodged a bullet! That was until early October when Captain Jim drove down to both check and work on our Namaste. He called from the Burger King in Indiantown, excited to arrive and get to work on his beloved and beautiful ketch. I didn’t hear anything for many hours and when I did the news was devastating. Unknowingly to all, hurricane Irma had not been kind to the Namaste. It seems she suffered the perfect storm. Her scuppers clogged by flying debris, while many inches of rain fell in just hours, along with a power outage for 5 days rendered the bilge pump quiet, Jim found her cabin filled with 3’ of water and everything inside floating, moldy and corroded. After having her pumped out and before calling me, Jim’s next reaction was to purchase 24 rolls of paper towel to begin “cleaning” her up. However, with considerable urging he slowly realized that the task ahead was beyond him. The outside – hull and rigging were perfect but the interior cabin and all working parts (engine, transmission, batteries, electronics, etc.) were a complete loss. Restoring her again was simply not in the cards at this stage in our lives. There were many calls and lots of tears as she had been our fourth child and the Captain’s life-passion over the past 17 years. He knew every inch of her. In addition to restoration projects big and small, we enjoyed 8 years on Lake Erie at Put-in-Bay, Pelee Island, Kelly’s Island and Toledo Beach Marina. 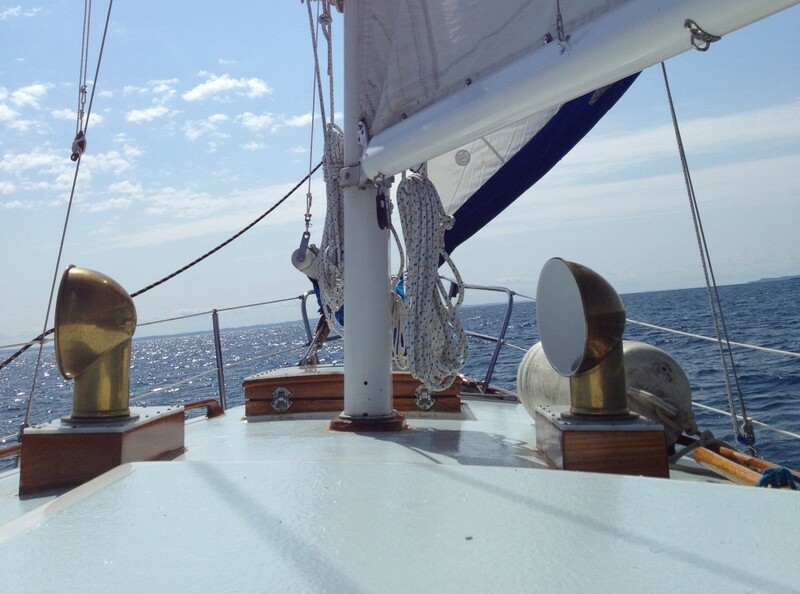 We circumnavigated Lakes Huron and Michigan moving her to Boyne City on Lake Charlevoix in 2009. We had wonderful trips to Mackinaw Island, Beaver Island, Washington Island, the North Channel and began our Loop on June 28, 2015. Our estimate is that she carried us about 7,000 miles over 17 years. In retrospect, responsibility for any problems we had during those years were ours. We forgot, misjudged, or didn’t know something. It was never her fault – she served us well, never-ever letting us down. Yes, a boat does have a soul and hers was a proud and gentle intrepidness. We hope that someone with time and skill will come along who wants to restore a great sailboat. We believe there is a young couple looking at her now. The insurance company declared her a complete loss. We are grateful to Boat U.S., underwritten by Geico, for their prompt attention to our claim. We couldn’t have asked for more at a time when most of Florida was in triage mode. Within two months we had a check in hand for the full insured value. . .but I get ahead of myself here. While she still belonged to us, we made another trip to Indiantown to salvage what we could including a reasonably new dinghy/motor and cockpit equipment (tools, lines, etc.). However, the cabin mold was so intense that we ducked in, grabbed what we could of sentimental value, said thank-you and good-by to a beautiful old lady. After consultation with and support from family and friends we determined that we would honor our dream and complete the Great American Loop. With the promise of an insurance check coming, we eventually began to look at boats in Florida so that we wouldn’t miss a season on the water. While on our salvage excursion we looked at ten boats in three locations. Several were possibilities but one stood out in the crowd as a classic trawler and not a work project. Her name is Gypsy Spirit and she was located in the Fort Myers Municipal Marina. Perhaps you saw her on TV as we understand that a national network covered Hurricane Irma from the corner of the marina where she was docked. Backing up – the purchase story begins in Faro Blanco Marina, Marathon FL. Gypsy Spirit, a 1983 Albin ’36, was docked across the way and owned by Jenny Lynn and Dan Girvan of White Hall, Michigan. We met them as fellow Loopers during our mutual stay on Marathon last winter where we shared countless docktale parties, a dinghy drift, and restaurant meals together over six weeks. They even cooked Jim spaghetti dinner while I was in Michigan visiting family in March. Before we departed north in April, Jenny Lynn showed us through their boat announcing it may be for sale as they were considering a bigger/faster boat. We thanked them but had decided that we were sticking with our Namaste. You can guess the rest of the story. We boarded Gypsy as one of the ten possibilities in October and knew almost immediately (well, at least I did) that Gypsy would be our choice. A shout out to Jenny Lynn and Dan for being the perfect boat sellers, now considered great friends. Their openness, enthusiasm, knowledge and follow-through have made for an easy process. Dan and Jim made yet another trip to Florida and later joined by our youngest son Curt for the survey, sea trials and move to River Forest Marina on the Okeechobee Waterway where she patiently rested awaiting our post-holiday arrival. Yes, it has been a difficult couple of months but we now see the silver lining to what had been a thundercloud in our lives We are humbled, grateful, excited and ready for a steep learning curve! Rest in peace Uncle George! Nice update, thanks for the news about the retired lady and her replacement. This is a beautifully written account of a heartfelt journey from such sadness to realizing the silver lining, as correctly forecast by Curtis. Thanks Jo, and all the best to you and Captain Jim! I’m so sorry about Namaste. But what a great boat “Gypsy Spirit” travel well. Stay safe. Hopefully the screening ? On top will keep you free of the biting and annoying insects. Great blog and good to read the updates. Wow, is all I can say! Im so sorry for your loss, but thrilled that you are able to turn it around and continue with your plan. It must have been devastating for Jim to find Namaste in the shape it was internally and to be alone and you in Michigan. I laugh at your nursing school picture-I have the same uniform and apron at Butterworth Hospital School of Nursing in the 70’s! We had to wear a cap as well, which I still have. Your family looks hoary, loving and full of great energy. Im certain your life is very exciting with all of the grandchildren. We take off in early Feb for 2 months in Hawaii-shared between the North Shore of Oahu and the Big Island. Escaping winter is our pressing goal! Hope to see you around Dunham this Spring. Travel safe. Happy New Year! Wow…and another Chapter in Your Book of Life begins. It is truly amazing when you look back and see everything working towards the “Silver Lining”. I♡IT! Keep us in “the loop”. I just saw where it says I posted my comment at 12:35 p.m. but it was more like 7:30 a.m.